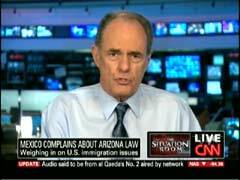 On Thursday's Situation Room, CNN's Jack Cafferty blasted President Obama and Mexican President Felipe Calderon for their criticism of Arizona's new anti-illegal immigration law, stating that the two were "whining" about the law. Cafferty singled out Calderon for having "a lot of nerve...complaining" about the Arizona law and labeled Congress's standing ovation for the Mexican leader "disgusting." The commentator devoted his Cafferty File segment 13 minutes into the 5 pm Eastern hour to slamming the two leaders' criticism of the Grand Canyon's State's newly-passed legislation. Cafferty wasted little time and targeted Calderon first for his criticism of the law on American soil: "Mexican President Felipe Calderon has a lot of nerve coming into this country and complaining about Arizona's immigration law, when all the state wants to do is protect itself against a flood of illegal immigrants from Calderon's country." He continued that "Calderon and President Obama are both whining about the Arizona law. Calderon, who also took the message to a joint meeting of Congress, is calling Arizona's law discriminatory." CAFFERTY: As for President Obama, he says he wants a federal fix to the immigration crisis in this country, which would have to come from the same federal government that has refused for decades to enforce laws already on the books. It's patently absurd. President Obama complains about Arizona trying to do something about a problem he- President Obama and the federal government- have created and choose to ignore. And with all the criticism of Arizona coming from Presidents Obama and Calderon; the Justice Department; the Homeland Security Department; our federal officials, like Attorney General Eric Holder, Department of Homeland Security Secretary Janet Napolitano- can't even be bothered to read the law that they're criticizing. If they did, they'd find out that parts of Arizona's law are word-for-word the same- exactly- as the federal statutes on immigration. But the only thing that matters to the administration is pandering to Hispanics again ahead of the midterm elections in November. CAFFERTY: Felipe Calderon should spend his time trying to create opportunities for his own citizens, so they're not driven by poverty and desperation to sneak into this country illegally. This country doesn't meddle in Mexico's internal affairs, President Calderon, and you ought to keep out of ours. Quite frankly, our border security is none of your business. Here’s the question: does Mexico have a right to complain about Arizona's immigration law? Go to CNN.com/CaffertyFile, post a comment on my blog. They gave him a standing ovation in the House [of Representatives] today. WOLF BLITZER: Yeah- all right.